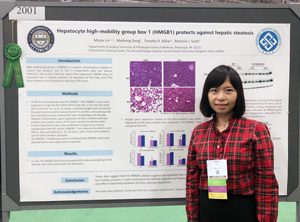 WISER is proud to announce that Dr. Minjie Lin's poster presentation of "Hepatocyte high-mobility group box 1 (HMGB1) protects against hepatic steatosis" earned a Posters of Distinction award, which represented the top 10% of all accepted poster presentations at the 2017 National Liver Meeting (AASLD) in Washington, D.C. This work resulted from a collaboration between Dr. Lin and Meihong Deng, under the supervision of Drs. Timothy R. Billiar and Melanie Scott. Dr. Lin stated that winning the award was a great moment for her. "I would really like to thank everyone involved, especially my supervisors, including Dr. Timothy R. Billiar, Dr. Melanie Scott, Dr. Paul E. Phrampus as well as Dr. Ying Li. Dr. Phrampus provided me with powerful psychological support." When asked about her experience at WISER so far, Minjie stated, �I really enjoy every moment at WISER. I enjoy working with every WISER staff member and I like every course offered by WISER�. Through successful integration of her research and clinical background, Dr. Lin�s goal is to develop competence and expertise in simulation and healthcare education. She believes by coming to WISER and experiencing firsthand what is offered here, she will be able to make this happen!